Obama's push for amnesty has some similarities to that of George W. Bush. First, both had an amnestia interruptus problem. For Bush it was 9/11. In fact, Presidente Fox was in the White House a week before 9/11 and both were talking about some sort of legalization program within months. For obvious reasons, legalizing foreigners would not have been very popular after they discovered who flew the planes into the WTC and Pentagon. And how they got into the country. For Obama the problem was the economy. You cannot sell amnesty when the headlines are screaming double-digit unemployment. And his chief-of-staff, Rahm Emmanuel, was NOT a fan of amnesty. For him, it is the third-rail of politics. So, Obama's promise of amnesty in the first year didn't happen. But when you compare Obama's amnesty push of 2013 with GWB's of 2006, some things are the same and some are different. The crowds are back. At least the photos of protesters show big crowds. Bush had the same thing in April/May of 2006. Hundreds of thousands turned out. For Bush those crowds would dwindle. They tried additional May Day parades but by the time Obama took office they were a footnote at best. Additionally, Bush made speeches at Hispanic Prayer Breakfasts, the convention of the National Restaurant Association and meetings of Contractors/Home Builders to push for amnesty. Obama has taken the same sort of approach to grab headlines and rally the troops. Gang activity is back. In 2007 it was Ted Kennedy and his Gang of 12. Schumer has his Gang of Eight. They are mastering the optics (or at least the MSM is doing a better job of cropping and framing). There are still some Mexican flags in the streets, but more are sporting the red-white-and-blue. And they are exploiting the children more this time. More placards are cropping up with the "Stop separating families," theme. And more of the cards are talking about citizenship. That is a detail that has been pushed by the unions. They don't want temporary work permits. They want a path to citizenship. I firmly believe this is a dream of the politicians more than the people themselves. I say that because the Mexican naturalization rate has been (and still is) pathetically low. It ranges in the 20-25% range. 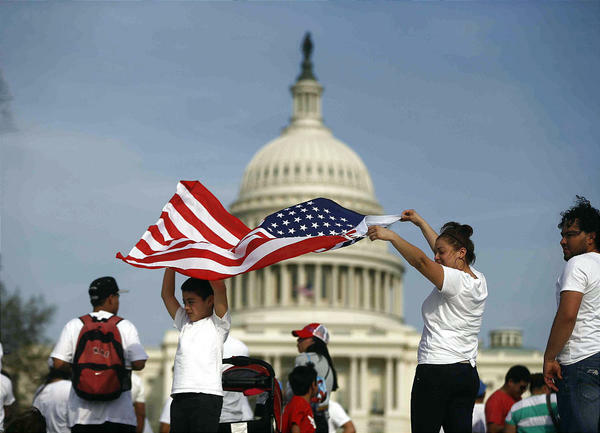 Despite national drives, threats of fee increases, lowering the requirements, even grants to pay the application fee...Mexicans in particular don't care about becoming US Citizens. Another difference this time around is the REAL unemployment rate. In 2006 there were 22 million unemployed people competing with the garden variety illegal alien. I would characterize them as 18-64 with a high school diploma or less. In 2012 that number is 27.7 million. The number of illegal aliens filling those jobs is around 8 million. That number still doesn't get the attention it deserves, but more people are starting to figure it out. Three members of the United States Commission on Civil Rights wrote a letter to the Chairman of the Congressional Black Caucus, Marcie L, Fudge, letting her know in no uncertain terms that the illegal aliens were making it harder for minority citizens to get jobs. In other words, GWB was an active negotiator. Obama is more aloof when it comes to policy. Or at least he's letting others do the heavy lifting. But Obama is a master at forming a parade. He has been out recruiting for the cause. Recently he hosted 13 religious leaders at the White House. This resulted in a photo op and nice statements about compassion from these ministers. He gave the Chavez award to the author of the Utah Compact, a model for state-level amnesty. Note, Obama is telling us that CONSERVATIVES want amnesty. The parade also has a statement from the Attorneys General of 35 states pushing for amnesty. And the usual collection of Police Chiefs from liberal cities. The Obama ground game is better than the one GWB had going. This time around we have the DREAMers who have "Come out." I guess it worked for gays. Obama has fallen short of his goal of getting these DREAM applicants to register and apply for the path. He's got maybe 60% of the turnout he expected. But those who are out make nice poster children for his cause. Time will tell what the outcome will be this time. Congress ignores the general public and continues to pander to special interests. They don't care about their low approval rating which is below 10%. All of them (from both parties) want a slice of the brown vote. And the mid-terms are still a year away. This is the amnesty silly season. May Day parades. Nice weather for protesting. Obama needs to get this thing done before Labor Day 2013 or it won't happen. Let's hope it doesn't happen.